Illustration from Buddha in the Garden by David Bouchard and Zhong-Yang Huang, published in 2001 by Raincoast Books. Artwork ©2001 by Zhong-Yang Huang. Lama Zopa Rinpoche has composed a comprehensive flower offering practice for accumulating great merit. This is a short summary. 4. A smell of scented nectar will come from the body. 5. The smell of the morality of the person will spread in all directions and corners. 7. One will achieve beautiful attractive things. 8. One will have great wealth. 9. One will be reborn in a higher rebirth. 10. One will quickly achieve the sorrowless state and achieve enlightenment, the great liberation. 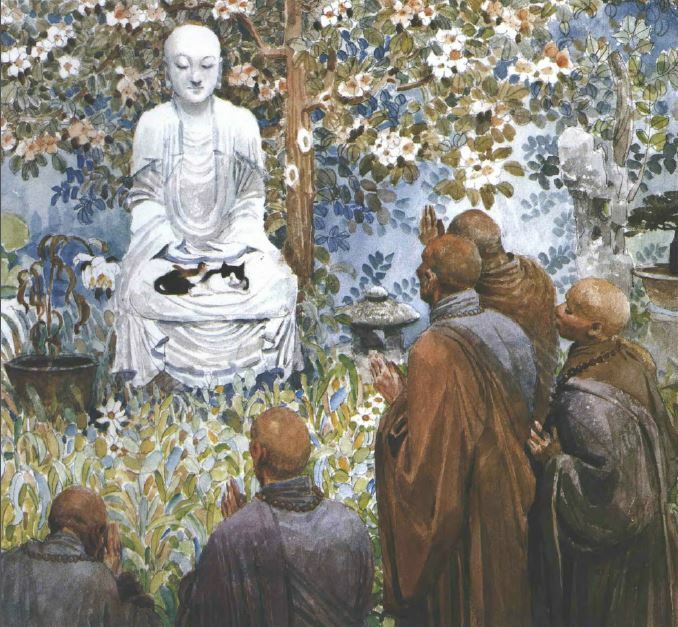 “The flower offering practice is used to make charity to all beings who have depression, those who have fear of death and dying, people whose minds are filled with anger, the emotional mind, the mind that thinks, ‘I am abused by others, badly treated by others,’ the mind that is full of desire. “Think of people with marriage problems where one’s husband or wife is unfaithful or has left, or who argue a lot. Immediately, by making the offering, so much loving kindness, tolerance, and affectionate mind is generated in them, and instead of wanting to harm, they want to help. Also, it is good to think of this one person as the most precious one in your life, the most kind and precious one who helps me. By receiving the flower offerings, their hearts are filled with tolerance, they have a very happy mind, filled with patience and loving kindness toward all living beings.